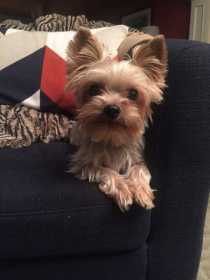 Bo is a three year old Yorkie. He is mostly silver with some tan around his mouth and ears. He is six pounds. He is very timid and shy. He loves the sound of a squeaky toy or the mention of treats or dinner. He is so very missed. Please help us find him.